Tuberculosis, an infection, that invariably involves all parts of the body, except Heart muscle, Thyroid gland, Skeletal muscle, and pancreas. It is a common infectious disease, especially in poor countries, notably in Angola, Bangladesh, Brazil, Cambodia, Congo, Central African Republic, and many others countries, according to WHO (World Health Organization). The disease mainly caused by Mycobacterium tuberculosis, but sometimes it can be caused by Mycobacterium bovis (reservoir cattle) & Mycobacterium africanum (reservoir human). M. tuberculosis is spread by inhalation of the respiratory droplet from an infected person during coughing, sneezing. After inhalation, the organisms enter into the lungs alveoli, then transform the macrophages into Epitheloid and Langhans cell and aggregates the lymphocytes in it to form tuberculous granuloma. Numerous granulomas aggregates to form 'Ghon focus'. In the case of M. bovis the organism transmitted through drinking non sterilized milk from infected cows. 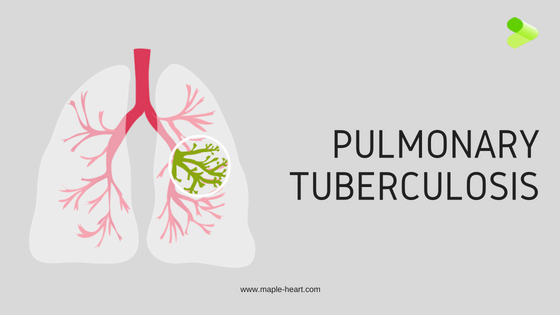 Based on the time of exposure it may be classified into Primary Pulmonary tuberculosis and Post Primary Pulmonary Tuberculosis or Secondary pulmonary tuberculosis. In primary pulmonary tuberculosis the patient is not previously exposed to the organism, but in secondary pulmonary tuberculosis, the patient is already sensitized by the organism. In secondary tuberculosis, the patient may be affected either by exogenous i.e. from an infected person or by endogenous source i.e. reactivation of dormant primary lesion. TB associated with other conditions, like AIDS. A cough often with hemoptysis (sputum mixed with blood) for 3 weeks or more. Fever for 3 weeks or more. Anorexia i.e. loss of appetite. Extreme of age i.e. children and elderly people. Immigration from high prevalence countries or areas. Close contact with infected people. Immunosuppressive patients like- HIV infection, Malignancy, Diabetes mellitus, Chronic kidney disease. Treatment with High dose Corticosteroids, Cytotoxic agent, TNF therapy. Primary prevention of the disease includes vaccination against M. tuberculosis, immediately after birth. Isolation of the infected patient from other patients, and using the mask for the patient is also important. Maintain personal hygiene and adequate treatment of the patient with the full course of medicine is very important. The aim of the treatment is to cure the patient and prevent recurrence and spreading of the disease to the unaffected patient. Two treatment regimens are followed for treatment of Pulmonary tuberculosis, one is six months regimen and another is eight months regimen. Six months regimen is for Category I patient and eight months regimen is for Category II patient.